EDMONTON, AB – The Edmonton Prospects continue to reshape their roster under Jordan Blundell, with a number of new additions to speak about prior to the Western Canadian Baseball League (WCBL) season kicking off in May. The reason the team aggressively pursued their new recruits, said the head coach, is pure competition. As part of that process, the Prospects announced the signing of two players from Benedictine University at Mesa (Arizona). Both Travis Hunt (OF) and Austin Cannedy (RHP) will join the organization this summer as the team looks to eclipse its 23-23 record in 2018. Much like the Prospects prior signings out of Yale, Blundell was attracted not only to the players but the programs. Hunt, an OF from Moreno Valley, California comes to the Prospects with a stellar reputation from his tenure at Benedictine Mesa. Last season, Hunt posted a 0.313 BA and 34 RBI, with his 9 home runs leading the team. His big bat is something that Blundell is hoping will translate to the larger confines of RE/MAX Field. Cannedy, a RHP from Clayton, California joins the Prospects after a successful 2018 season that saw him split time between Los Medanos College (5-4, 3.09 ERA, 81 K), and Diablo Valley (3-4, 3.92 ERA, 39 K). After successful playoff runs through the past three seasons, it appears as though the Prospects are yet again building for success. 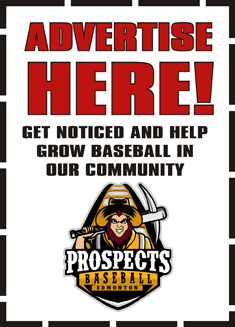 The Prospects are currently promoting their Fireworks Pack and “Bring Your Dad” Pack tickets, now available online. A reminder that the annual Edmonton Prospects Gala will be taking place on Saturday, February 16th at Fort Edmonton Park. Buck Martinez, John Short and Kent Morrison are all confirmed to attend this year’s event.